I’ve always had a fondness for water mills – it was my ambition as a child to one day live in one – but I’d never heard of a tide mill until I came to Suffolk. There’s probably a good reason for that – it is thought there are only five left anywhere in the world that are in working order and still grinding wheat to make flour. Two of them are in the UK and one of them is in Woodbridge in Suffolk. It’s a rare and lovely piece of industrial history. Tide mills were usually built on creeks a few miles from the coast. The pressure of the incoming tide would push open specially-built sluice gates and fill the mill pond. As the tide fell, the weight of the water now in the pond would force the gates closed again. The miller would open another set of sluices to the mill race and the water, rushing out, would turn the wheel. Woodbridge tide mill’s original pond is now the town’s marina and water is piped into a smaller holding pond. 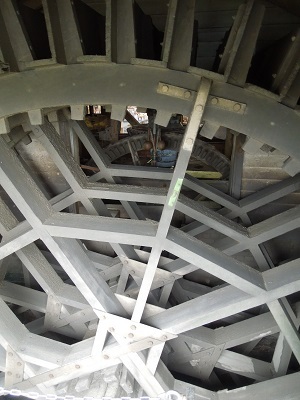 But its huge wooden wheel, thought to be the biggest in the UK, is still powered by the tidal waters of the River Deben. The present building dates back to 1793, and there’s been a mill on the site since at least 1170, when it was run by one Baldwin of Ufford. But by the late 1800s windmills and watermills were being put out of business by the much more efficient steam-powered roller mills. 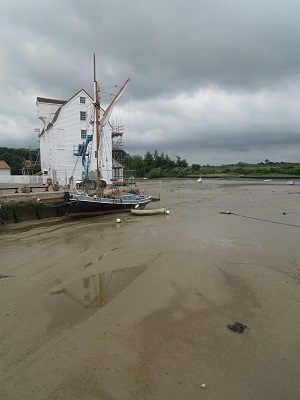 Woodbridge tide mill continued in operation until 1957, the last of its kind in the country. That it survives at all is thanks to a local philanthropist, Jean Gardner, who bought the mill at auction in 1968, saving it from demolition. She raised money for its restoration and eventually handed it on to the town council, to be preserved in perpetuity for the benefit of the people of Woodbridge. 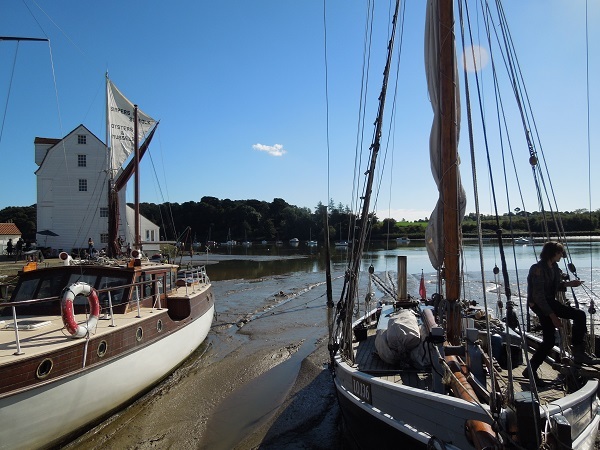 Today the tide mill is run by a charitable trust. In spite of Mrs Gardner’s efforts, by the early 2000s the mill was beginning to deteriorate again. A wooden mill on an estuary, powered by salt water and with more salt in the air, is inevitably subject to decay. 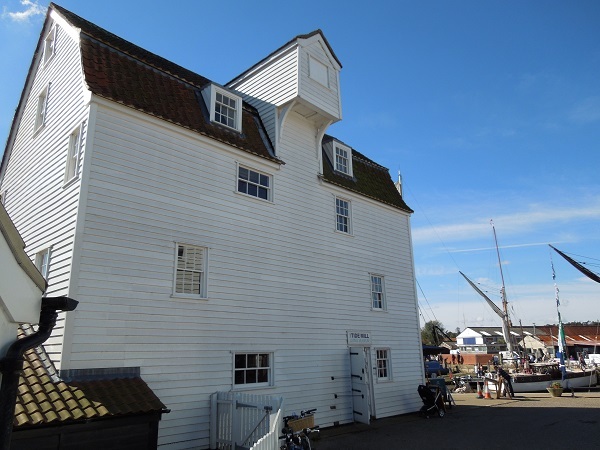 The chairman of the Tide Mill Trust, Nigel Barratt, says the mill has always been dependent on visitor income which isn’t enough to cover the £10-15 thousand pounds a year it costs to maintain. So the Trust applied for a grant from the Heritage Lottery Fund and in 2011 the mill was closed again for a major overhaul. The weatherboarding was replaced, the roof mended, the pond and millrace were dredged and a new waterwheel was built nearby in Lowestoft. 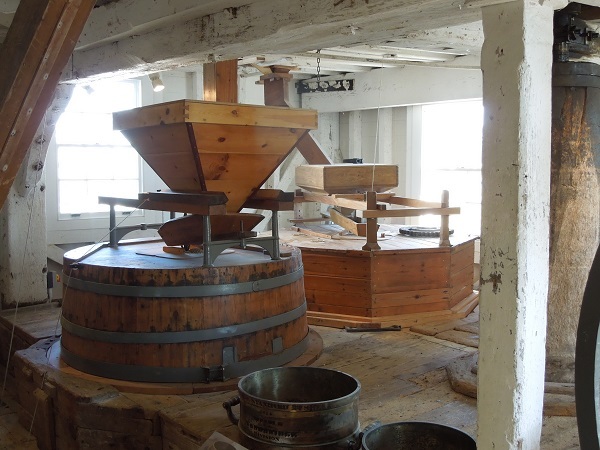 The wheelhouse and its walkway were completely rebuilt, the machinery overhauled and the millstones dressed. It was a mammoth task but today it’s in full working order again and a joy to watch when it’s in operation, which thanks to its dedicated team of volunteers is on a regular basis throughout the summer. It is also fantastically beautiful, a working relic of a vanished age. 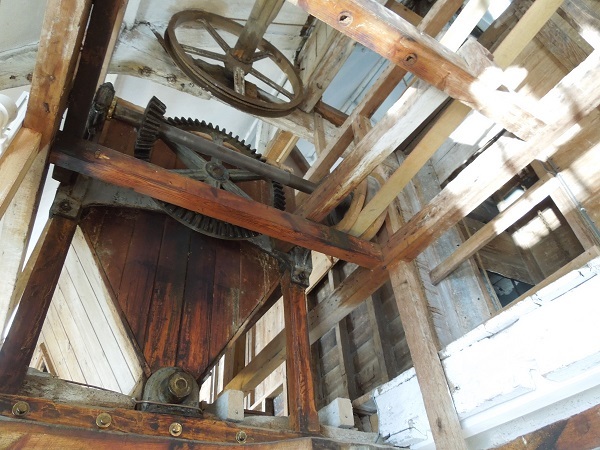 You can watch the millers opening the sluice gates (it takes two of them), see the water pouring in to turn the wheel, marvel at the giant cogs that drive the millstones and sneeze as you watch the flour falling into sacks. And you can buy a bag of flour or a loaf of bread to take home. I did both and I’ll share a recipe next week. Meanwhile, if you’re in the area, please do visit. You can check out the opening times and learn more here. 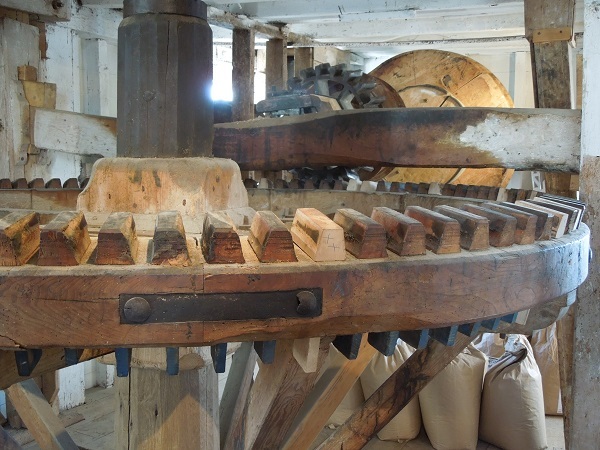 This entry was posted in Breads, Producers and tagged historic Suffolk, industrial architecture, milling bread flour, watermills, Woodbridge Tide Mill by Linda Duffin. Bookmark the permalink. Fascinating stuff – and gorgeous photos. I can practically smell it! (I also now have the mouse in Amsterdam song lodged in my head, thanks). Did you buy any flour and if so what was the quality like? Yes, I did. They only make wholemeal and it’s very good. Extra-strong so great for bread making. It has a lovely flavour. Did you see the pix I posted on social media of the tear-and-share bread? Recipe coming to Mrs P next week. Beautiful mill- didn’t know it existed. Reminds me of some buildings I have seen in New England. Very interesting post. Thanks, Penny. It’s well worth a visit if you’re ever in the area. There’s something tremendously satisfying about watching the wheel turning all the machinery – like looking at the inner workings of a watch but giant-sized! Fabulous building, fabulous article. The photographs evoke the brackish smell of the Deben, your words evoke the creak of the wheels and the smell of the flour. Lazy days, the buzz of bees in the summer … Thank you, Linda. Thank you, Chris! It is certainly a lovely old building in a beautiful setting. A good place for sailing too. And it must be my east coast heritage but I do like mud flats! Great post. It looks as though our next visit to East Anglia will have to include Suffolk. And Woodbridge Tide Mill. Thank you. *does small victory lap around kitchen* Told you so!